Annisquam Herb Farm: Clary sage . . .
Clary sage . 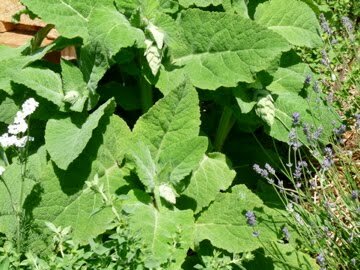 . .
Clary sage has large, fuzzy, soft green leaves. The blossoms are just beginning to fill. The first year, shown at left, the plant will put out just leaves. The second year clary sage will develop buds that will be held high on tall stalks. The leaves and the blossoms can be used to infuse an oil for lotions and massage oils.